Due to a building issue, the Draper Offices will be closed from 9:00 a.m. to 11:00 a.m. on Tuesday, June 29. We apologize for any inconvenience! Several Draper students have exciting news to share. Please join us in congratulating them! If you have news you’d like to share with the Draper community, let us know. Email us at draper.program@nyu.edu. Dani Limos has a new job working with Peace First, an organization whose goal is to integrate social-emotional learning into the schools’ curriculum and culture. Dani will be working as a Peace First Americorps Member for 10 months, going into schools in NYC and teaching kids the skills of conflict resolution and civic engagement through games and community service projects. In the fall, she’ll be leading weekly experiential activities, and in the spring, she’ll be helping each classroom create and implement community service learning projects to apply their learned skills in a community context. Faith Merino-Davies will be presenting a paper entitled “Grotesque: Writing, Naming, and Disfiguring Women’s Bodies in and Wide Sargasso Sea and Myal“at the “Hybrids, Monsters, Aliens, and Other Creatures in 20th and 21st Century Writing” Conference at the University of London’s Institute of Germanic and Romance Studies this September. April Pierce has had papers accepted at three upcoming conferences. In August, she’ll be presenting a paper entitled “Representation, Concealment, and Techne: 21st Century Reimaginings of Heidegger’s Work” at the International Society for Hermeneutics and Science’s annual conference in Vienna. The paper examines artificial intelligence, avatars, and bioengineering from a Heideggerian perspective. In September, she’ll be presenting her paper “Where Does the Poem Go?” at the “Cosmopoetics: Mediating a New World Poetics”conference at St. John’sCollege, Durham University. The paper is an experimental essay which seeks to uncover the poetic audience: their motivations, their modes of listening, and their philosophy. April and Seth Taylor Garrison will be co-presenting “The Metaphorical Horizon: Between Facts and Fiction,” at the 5th International Conference on Interdisciplinary Social Sciences in Cambridge, UK. April and Seth’s proposal can be read on the conference website. This summer, the Neue Galerie presents the film series “Weimar on Screen.” The tumultuous years of the Weimar Republic (1919-1933) were a time of far-reaching social, political, and cultural upheaval. In spite of this turmoil, they brought about a flowering of art and culture in Germany, particularly in cinema. The films in this series are brilliant examples of Weimar-era filmmaking, and they illuminate aspects of the culture of the period. Films are presented to the public free of charge on Mondays at 4 p.m. in Café Fledermaus. For more information about Neue Galerie programming, please visit our website at http://www.neuegalerie.org/programs. Draper is still finalizing course offerings for the fall 2010 semester, but many new classes and updated descriptions have been added to the website. Check out the latest offerings (here: http://www.draper.fas.nyu.edu/object/draper.courses.fa10) and keep checking back throughout the summer for last minute changes before registration. A writer since the age of 12 (a “serious writer” since the age of 20), Draper student Ji Hyuck Moon has been relentlessly pursuing his ambition to become a successful fiction author for much of his life. 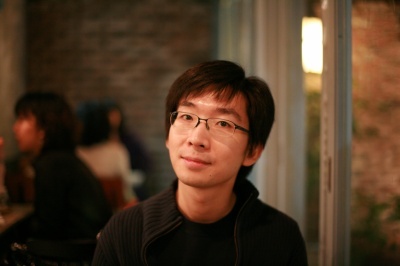 This past year, he published a Science Fiction short story entitled “Chaser” on a prominent Korean website, and the story will be published as part of a larger print anthology this summer. He has also translated seven books from English into Korean. But while he has achieved a great measure of success in both the realms of fiction and translation, Ji Hyuck continues to set new goals for himself. Ultimately, he wants to write in English—to be an authentic Korean voice in American letters. Choosing not to write fiction in one’s native language is a formidable objective, but Ji Hyuck points to one to one of his favorite authors, the Chinese-American novelist Ha Jin, as an example. (Jin began to learn English at the age of twenty, and now writes exclusively in English.) Ji Hyuck sees the switch to English composition as a creative choice as well as a practical way to break into the American literary community. “Writing in English, I can use language more as a tool,” he says. “Korean is too comfortable for me.” He favors simplicity in his work, and hopes to reduce any “surplus in [his] writing.” This, he says, will be easier to accomplish by writing in English. Although he’s always wanted to be a fiction writer, he’s found himself involved with many other endeavors during his life. For one, there’s his involvement in translation. The process to publish fiction in Korea, he explains, is rather convoluted. It’s expected that authors will win an award from a literary journal or newspaper competition before they can expect to be published in most venues. But although he was frequently a finalist in these competitions, he never won. It was dispiriting, he explains, having “no results” to show for ten years of dedicated work. So he jumped at an opportunity to translate a book from English, when a publishing agency contacted him with an offer. After completing his BA in Korea, Ji Hyuck applied to MFA programs in the United States, but was not offered admission to any of them. He took a copy-writing job with an advertisement agency, thinking that doing any writing for a living would be better than nothing, but found the work dissatisfying. “You spend all day writing small, trivial ads which no one even looks at in the newspaper,” he explains. And so he turned back to academia, and eventually, found himself at Draper. Although balancing his creative and scholarly work at the same time has been difficult, Ji Hyuck is now invested in both worlds. He is considering the possibility of pursuing a Ph.D. in the future, but is also continuing to write fiction. He’s recently completed another short story which will be published in a Korean mystery anthology, and is working on a novel. And while sometimes it seems like there’s too much to juggle, he always finds the time to write. 1. When did you start at Draper? This is my first semester at Draper. I was admitted to Fall 2009, but I deferred one semester to graduate from my former graduate school, Korea National University of Arts. 2. Are you a full or part-time student? Full time. Every international has to be full time student. 4. What are your primary research interests? Asian American literature and Asian immigrant writers – Ha Jin and Chang-rae Lee would be ideal examples. Although the Asian population in the United States is increasing rapidly, their presence in literature is hardly visible. Where are they and who is speaking for them? I am curious to know what their voice is and how their voice resonates in this multi-cultural society. After I was rejected from an NYU Ph.D program, I received a letter suggesting I consider Draper. At that time, I was totally exhausted from all the application process, so I thought it was spam mail at first. (Actually, it was in the spam mailbox.) A few days later, I read it again before emptying my spam mailbox and found it worth thinking about. I couldn’t decide what I should do, though I knew this might be the last chance for me. I hesitated for two reasons: First, Draper is Master’s program but I was already getting an MFA degree from Korea National University of Arts (KNUA). Second, I had come to mistrust the term “interdisciplinary” because my graduate major, creative writing, was also an interdisciplinary program. At KNUA it is said that students in the interdisciplinary program are “everyone’s children,” But this also means the opposite: Everyone’s children are no one’s children. After careful consideration, I finally decided to apply to Draper. New York is a place where young writers should go and, above all, NYU was the only school that gave me a second chance. As mentioned above, I deferred one semester to graduate from KNUA, and to get married in that summer. I am still not sure that I made a right decision, but so far, I am satisfied with the courses I am taking and the atmosphere of Draper. Maybe it’s only after everything is finished that I’ll know if I made the right choice. 6. What do you plan to do after Draper? Basically, I plan to apply another Ph.D. program in literature. If I can call that my short-term plan, my long-term plan is becoming an immigrant writer. I don’t know whether it is possible or not for now, but I’ll try and see what is next. Writing fiction and teaching students (which also means learning, of course) – that’s what I want to do not only after Draper, but also for the rest of my life. 7. Do you have any special activities or projects outside of your academic work? I write fiction, including short stories and novels. As announced in Draper’s blog, I published a Science Fiction short story entitled Chaser on naver.com in this February and it will be published later by Minumsa in this coming fall. I also have a contract with Woongjin, a leading publishing group in Korea, to publish a collection of my short stories later this year. Currently, I am working on a novel entitled Wednesday, which is a story about Jesus’ last (and lost) Wednesday before he died. I also translate books into Korean. The most recent translation is Elephant Faith, by Cynthia Boykin, which was published in Korea in January. So far, I have translated 6 books and my 7th book, In Quiet Light: Poems on Vermeer’s Women by Marilyn Chandler McEntyre, will be published later this year. People. Comparing with my soul city, Seoul, New York has much more diversity. You can encounter any kind of people around the corner. I like that I can’t predict who I will meet in the street at all. The same thing happens in class. The big picture made by the students who have different background and culture is fascinating. The smell. I have to take subway to get to NYU, but the smell of the subway stations is always hard to stand. Especially the smell after the rain – which is really unbearable. Compared to New York, the subway stations of Seoul are just like hotels. 10. If you were not in academia, what would you be doing? 11. What was the last book you read for fun (not for class or research)? Currently I am reading Art and Fear by David Bayles and Ted Oland, Stories of Your Life and Others by Ted Chiang, and The Bridegroom by Ha Jin. These books are so great that I don’t want to finish them too fast. 12. If you could change anything about ______ [fill in the blank: New York City, the world, the economy, your hair…] what would it be and why? 13. How do you feel about social media and which, if any, do you use most? Social media on the internet is not very attractive to me. In my twenties, I was a big fan of cyworld.com, the leading Social Network Service in Korea, which is similar to Facebook. I was a heavy uploader and would write something on my mini-homepage every day – but now I don’t use as much. It’s okay for keeping in touch with old friends long distance, but definitely not good for making new friends.